Home performance upgrades often include sealing gaps and cracks that allow outside air to infiltrate your home. Ensuring your home is well sealed should also include attention to ventilation so that fresh, healthy air is circulated throughout your home on a regular cycle. Homes often suffer from excess moisture, mold and dust infiltration due to poor ventilation or a poorly sealed home. Excess moisture can make your home hard to keep clean and can create musty smells and unhealthy mold. Moisture from cooking, showers, dryers and dishwashers can contribute to humidity in kitchens, bathrooms and adjacent rooms. Dust mites and allergens, which can increase allergy symptoms, may also be the result of poorly sealed ductwork that continuously cycles dust through your house. Other sources of dust can include fireplaces, smoking materials and pets. 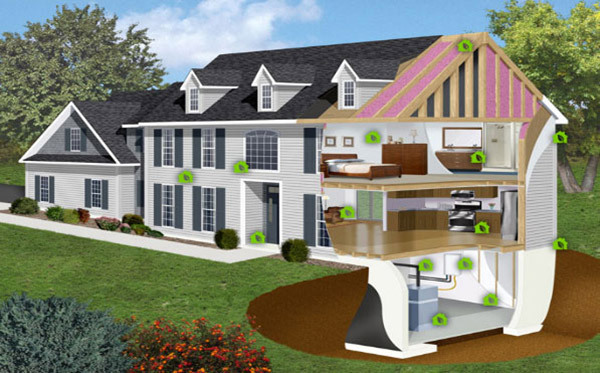 All these elements contribute to indoor air pollution and, over time, can make you feel miserable in your own home. BPP‘s home performance audit can help diagnose the sources of air infiltration and seal them off with ventilation repair. Once that is accomplished, our experts can design a mechanical ventilator system that provides fresh, clean air that is cycled through your home evenly and reliably. The simplest and less expensive option is mechanical ventilation, which provides continuous exhaust of stale air before it can build up and cause problems. BPP can install a Smart Ventilator System to provide continuous air to fit your California home’s specific needs. Their quiet, efficient motors are a level above the common bathroom exhaust fan and are ENERGY STAR®-certified. A balanced ventilation system draws fresh air into the home and distributes it through one set of ductwork, while separate return ducts exhaust stale air out of your home. Because the amount of air being moved into the house matches the rate of exhaust, the air pressure inside remains constant. The technicians at BPP recommend HRV/ERV systems for their quiet operation and ability to capture heat or energy from the exhausted air. HRV or Heat Recovery Ventilation uses a heat exchanger in the ventilation unit to capture heat from inside air before exhausting it outside. The captured heat is then transferred to incoming fresh air. HRV ventilation units are typically used in cooler climates to recover about 70% of heat that would otherwise be lost. ERV or Energy Recovery Ventilation capture indoor heat like HRVs but also remove humidity from incoming fresh air. As a result, ERV units are generally used in warmer climates that have high humidity. This conserved energy ensures better efficiency in your home’s heating and cooling system. The units operate with simplified flexible ducting to remove moist air from kitchens, bathrooms and laundry areas and replace it with fresh air in bedrooms and living areas. Ready to improve indoor air quality with a ventilation system? Call BPP at (925) 256-1092 or submit our online contact form to schedule an appointment. One of our technicians can identify the right ventilation system to meet your home’s requirements.